Broadbank Earth Circle / Enclosure looking through the centre N-S.
OS grid reference: SD 90236 35225. 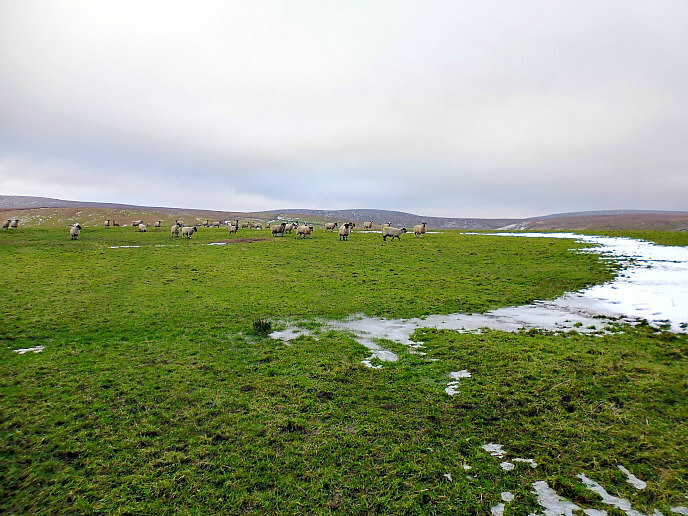 A fairly large Iron-Age earth circle/enclosure and possible settlement, situated at 350m above sea-level, which is located at the northern end of Halifax road, overlooking Thursden Valley, near Briercliffe, in Lancashire. Sometimes called Burwains Camp. It is located at the northern end of Halifax road (High Ridehalgh), going out of Briercliffe, just before the World War II concrete pill-box. On the opposite side of the lane is a carparking area and picnic site, with beautiful panoramic views over Boulsworth Hill, but it is also easily reached coming over from Nelson past the Coldwell reservoir and Activity Centre, and turning right at the pill-box. There is not much to be seen of the earth circle/enclosure at ground-level – it is best seen from an aerial view and from that it is quite a well-defined earthwork. The site is on private farmland and is surrounded by a wall and barbed-wire. The town of Burnley is 3 miles to the south-west. Broadbank Earth Circle / Enclosure viewed from S-E. The large earth circle of Iron-Age date just beyond the wall measures approx. 45m vertically and 40m across, and around the perifery there is a narrow, possibly, defensive ditch-line and bank. At the NW and SE sides there has been some damage due ‘perhaps’ to farming methods, or something else. The ditch that runs through the centre of the circle and out from it may be quite recent; this was 3.5m deep when excavated, and 25cm across; and there are still the ‘noticeable’ remains of a slight curved bank at the W, S and E sides. At the NW and N sides there are two small earth circles: 9m x 11m and 12m x 12m respectively, which could be hut circles? These connect with the large circle by way of short ditches or entrance ways, while at the E side there looks to be a “faint” outline of a medium-sized circle that is approx. 28m x 28m, but this has suffered some damage at its SE side possibly due to its closeness with the wall, past excavations, or something else. In 1950 the circle was excavated by The Archaeology Department of Liverpool University. A hearth was discovered at the E side, and there were numerous flint and chert flakes as well as a stone axe (4½ inches long) of Langdale origin which had a curved cutting edge and a thin rounded head and a smooth surface, but there was no evidence of polishing, according to John Dixon & Bob Mann in their book ‘Historic Walks Around The Pendle Way’. 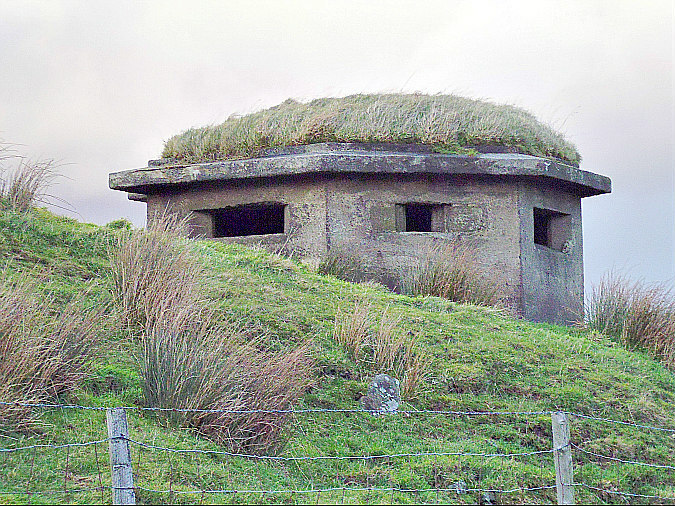 World War II pill-box at Burwains Camp. Clayton, John A., The Valley Of The Drawn Sword – The Early History of Burnley, Pendle and West Craven, Barrowford Press, Barrowford, Lancashire, 2006. Archaeology Department of Liverpool University, Report and Pamphlet, 1950. 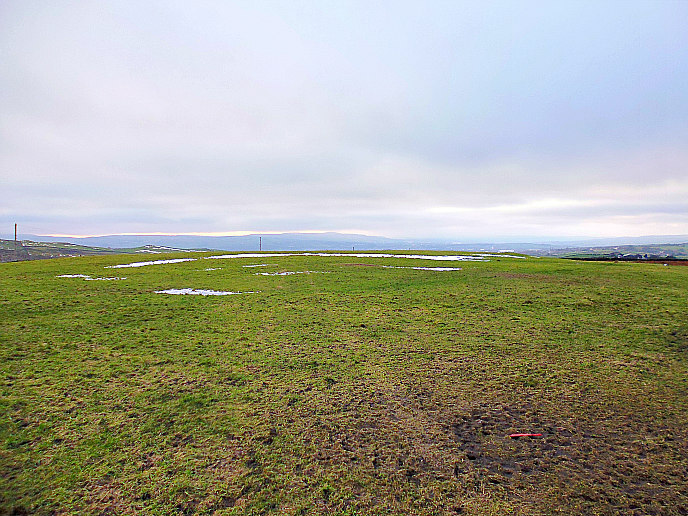 Categories: Camp/Settlement, Earthworks | Tags: Broadbank Earth Circle/Enclosure at Briercliffe in Lancashire | Permalink.